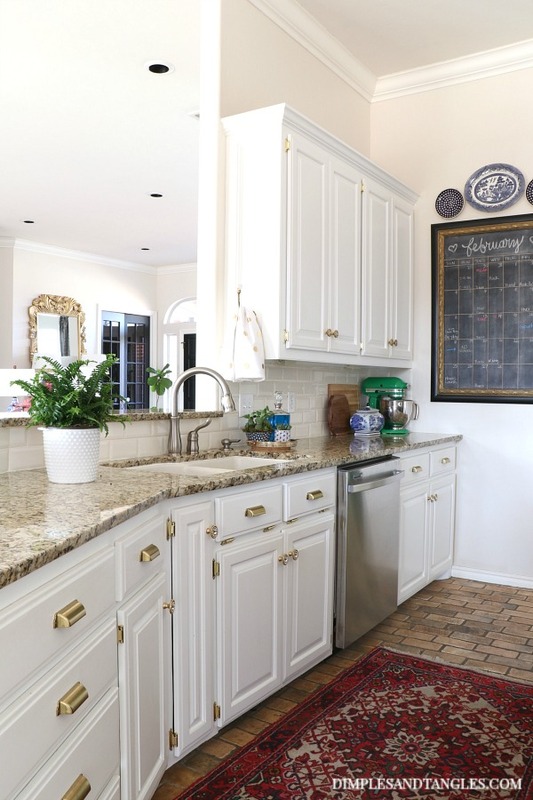 Today I have a kitchen update to share with you. 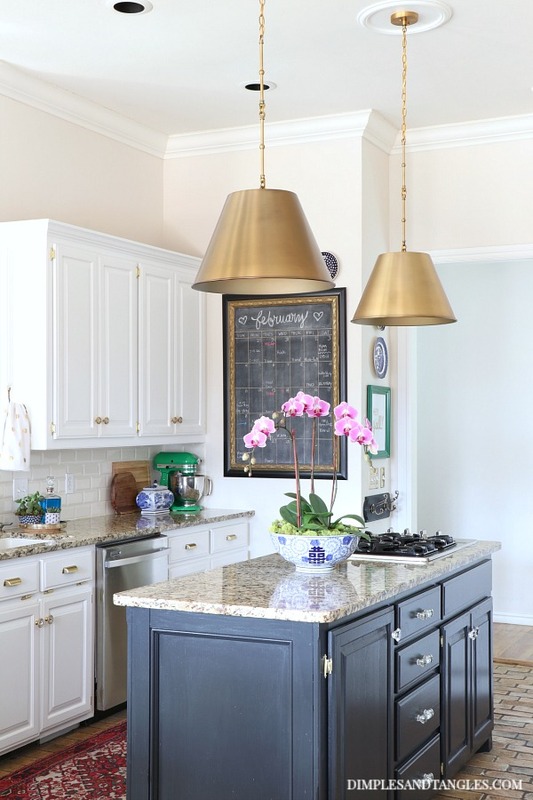 I'm almost embarrassed to write this post... if you've been around a while you'll know that this is the fourth time I've changed out the pendant lights over the kitchen island since we moved some of the can lights and installed the original set five years ago. I'm sure I've said it before, but I'm not a pro decorator. I try things around my home all the time and if they don't end up working out, I learn a lesson from it and move on and try something different. This is definitely a case of if at first you don't succeed, try, try again! Here's a little lighting recap if you don't remember. I started out with thrifted lantern fixtures, replaced those down the road with these lotus fixtures (which I LOVED but ultimately decided they were too small for the space), then repainted the lanterns (I experimented with red) and put them back up...then re-painted them again, this time gold! I did like the style of the lanterns and the gold color, but I finally figured out that I needed something more solid and substantial than the open frame of the lanterns. 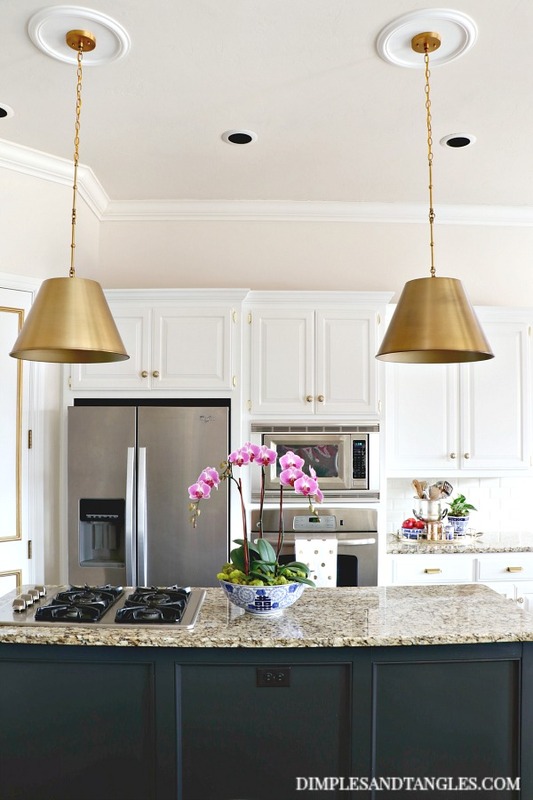 The kitchen area is so open that the pendants needed to have a bit more presence to get the attention they deserved. 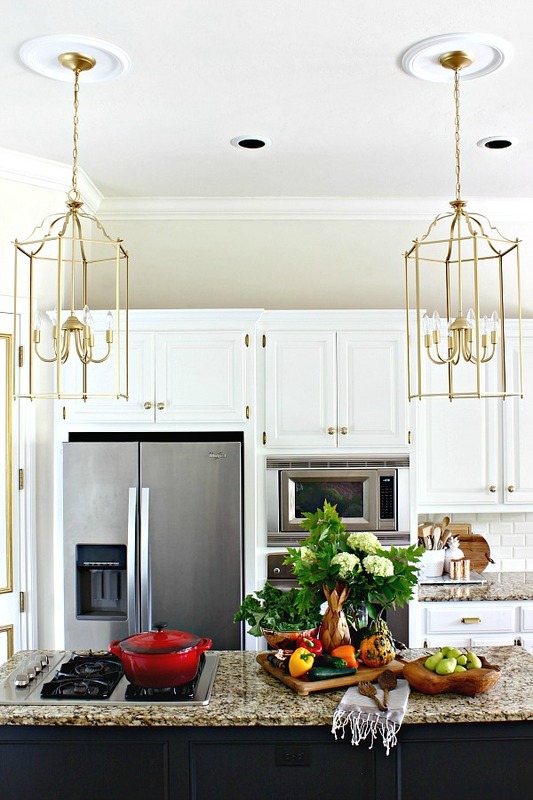 After finding inspiration in friends' homes and on Pinterest, I searched around and found these warm brass pendants. And, after seeing them used by several designers that I follow in their projects, I knew I was headed in the right direction. As soon as we got them installed, I was immediately so happy with them. And, although he's always happy with whatever I do, my husband just went on and on about how much he liked them too! The round shape really helps to break up all of the square things and straight lines around the room, and I think the pretty rod detail on the lower part of the chain makes them even more special. Another benefit to this style of pendant is that they do a great job of casting light down onto the counter work surface. The lanterns that we previously had spread light around the room but did not direct any light downward. They accommodate a 100 watt bulb, and I wondered if it would be bright enough, but they are fantastic! They provide plenty of task lighting, and we even have them on a dimmer switch and don't often need to use them at full power. We love the warm glow they cast at night too when the lights are dimmed. One other note on the light... when considering these lights, I was worried that the gold interior of the shade would give off a glow that was too warm/yellow-ish, but it doesn't at all! The light given off is nice and white and clean. We used 60 watt equivalent LED dimmable bulbs and are very happy with them. The other touch up project that I've been wanting to do in the kitchen was to paint or replace the hinges. 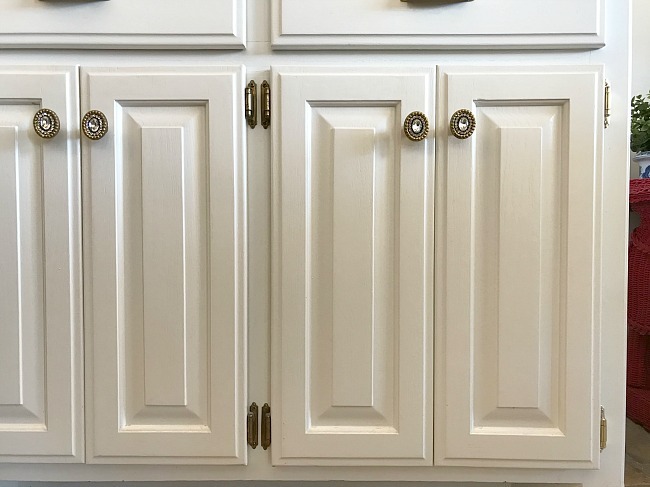 A little over 3 years ago when I repainted the cabinets, I tried to save a little money by stripping the paint off of the hinges that had been painted over and re-using them. Well, that process left them a dull, dark brass color and that was bothering me. 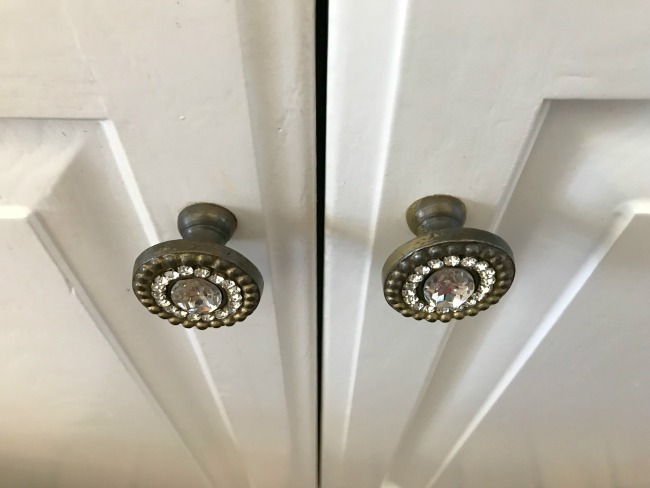 I debated removing and spraying them all a brighter gold, but decided if I was going to that much trouble I'd just go ahead and spend the money this time to buy new hinges in the finish I wanted. Here you can see how dark they were- the center hinges were the old ones and I had already replaced the far right ones. I bought polished brass and they're a nice bright color without looking dated. I also needed to touch up the lower knobs. Back to 3 years ago when we refreshed the kitchen, I liked these sparkly ones but they came in oil rubbed bronze, so I taped off the centers and sprayed them gold. I guess 3 years worth of wear is pretty good before a new paint job was needed! Here they were before, I just removed them, taped off the center again, and resprayed them. New hinges and new paint on knobs... better! Here's a PSA if you're interested in switching out your hinges some day... file this under learning from my mistakes! Long story short... when I bought 22 new pairs of hinges, I unknowingly bought the wrong kind. I only checked to see that they were the same size of the previous hinge and bought the finish I wanted. Then I proceeded to replace ALL of them and re-hang the doors before I recognized the problem. Both of these hinges are exactly the same size, but see how the one on the right slopes up more across the bottom rather than laying flat? 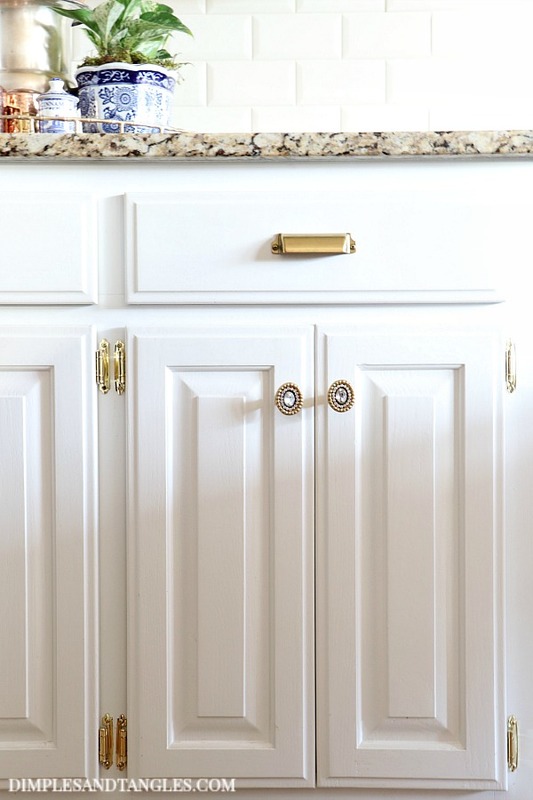 It's a self closing hinge and is somewhat springy- when it's really tightened down with the screws it flattens out and pushes the cabinet door out towards the opposite edge. So, if I tightened the hinges down all the way, the set of cabinet doors overlapped a good 1/4-1/2" in the middle where they were supposed to close together. Ugh. After a lot of time spent trying to adjust and tweak the tightness of the screws to make them work, I admitted defeat and realized something was wrong. I went back to the store to see if there was something I was missing. Of course there was... I bought the wrong kind of hinge! So, I found the flatter hinges that I needed at Ace Hardware and replaced the ones I needed to in order for the doors to fit together correctly. I replaced all of the ones where the doors close right together, and this time they closed perfectly. Like I said, live and learn... or maybe I'm the only person who would ever make that mistake! I particularly like how the finish of the new lights blends with the chandelier in the breakfast nook, tying together the vintage and more modern design. and I can confidently say these beauties aren't going anywhere for a long, long time!! 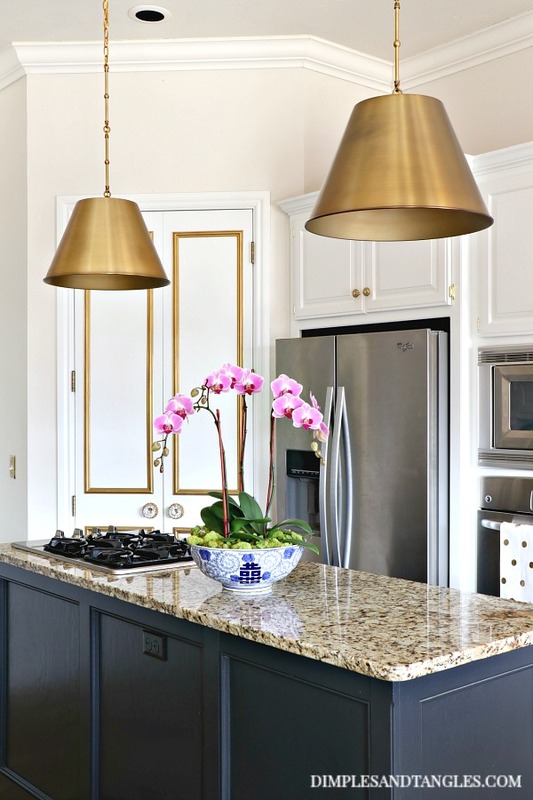 *I partnered with Bellacor for this post, we are thrilled with the pendant lights and happy to share how much we love them! They look beautiful! How great that your husband is so supportive about your changes too! Love the new pendants and the hinges. Your kitchen looks fabulous. I love the new pendants! 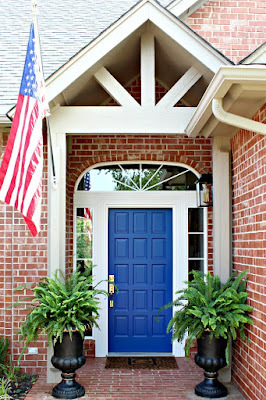 I love the gold detail on the door as well. 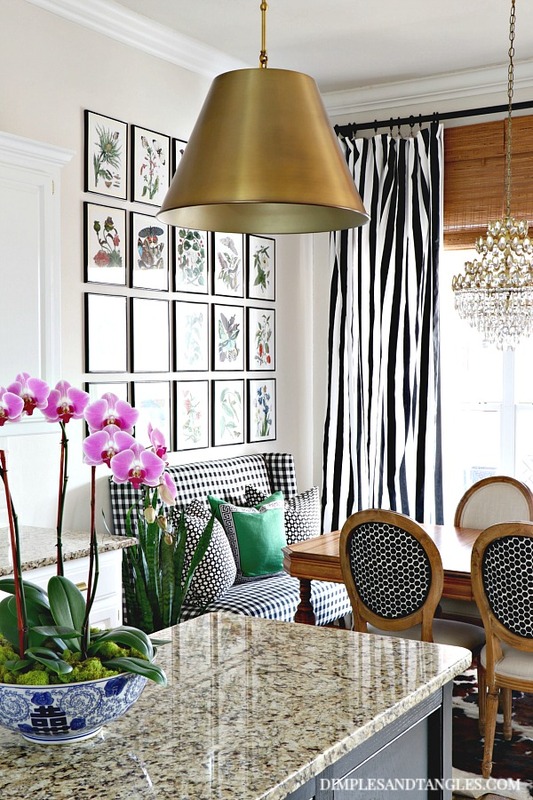 The new pendants look beautiful and they do tie in nicely with the chandelier. 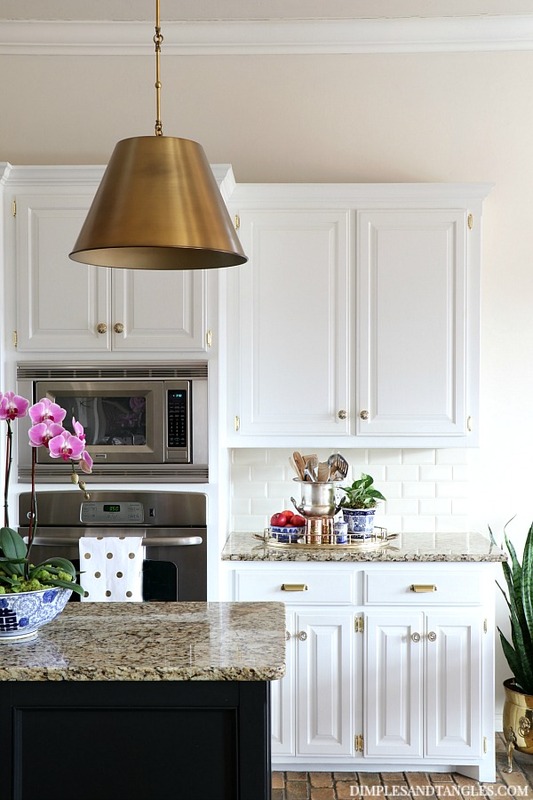 Would you mind sharing how tall your ceiling is in your kitchen? Thank you Kim! Our ceilings are 10 feet. Beautiful....just goes to show, details matter! Great job. Such a good point! Thank you Toni. I love the new pendants! Will you please share -- where do you store all of your décor items when not in use? I need to do a post on that some day... although I'm not that organized! There is a lot of closet/cabinet/shelf storage in this house that comes in handy. The dresser in the entry and china cabinet in the dining room hold extra smaller decor items, candles, and linens. I also do a purge about once a year, but really I move things around a lot from room to room and don't have too much extra to store. I love these new lights Jennifer!! Thank you so much, Lisa! They really warmed up the kitchen! I have to admit I love your sense & style of decor and enjoy seeing it all...but really...changing the pendent lights four times in ten years tells me you have a lot of time and your husband's money to spend on shopping and re-arranging...no offense! Thank you Kim, I'm glad you've found some inspiration here! But let me correct you, it's not my husband's money, it's OUR money that we both work very hard for. Also, 3 of those lighting changes were all the same lights- from the thrift store- that I just painted different colors for a new look. 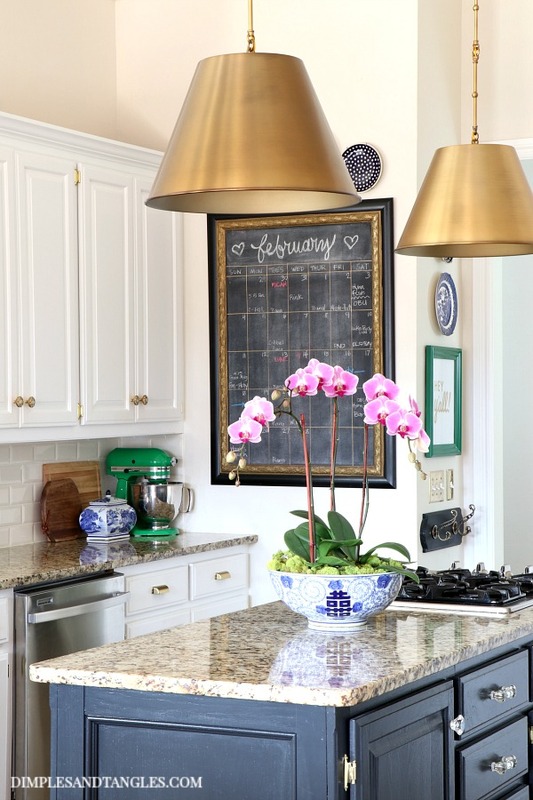 This blog gives me the opportunity to have a job where I share how I decorate and change things around periodically and seasonally, as well as feature products in my home from companies to share with my readers. So yes, I do spend a lot of time doing that for my job and sharing it here. WOW!!!! Those were some very big presumptions....and very chauvinistic ones at that. 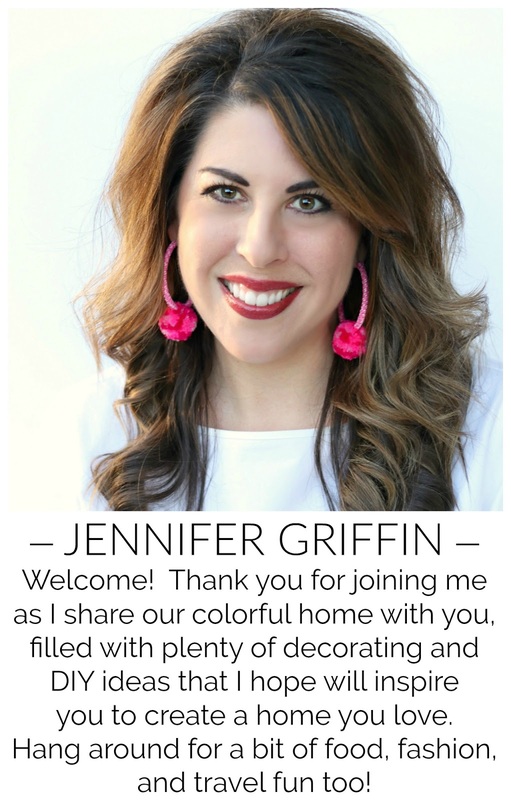 I came to this blog because I absolutely ADORE everything Jennifer does in her home and am constantly referring back for ideas on things that I am currently wanting to change or add to my own home and also just to ooh and ahhh at the latest decorating awesomeness that Jennifer is up to. I think most readers are here because they are looking for inspiration or an explanation as to something fantastic that Jennifer did in her home. When I see degrading comments made about someone who spends so much of their time exposing their private lives to the rest of the world just so that we can share it with her and hopefully derive some joy and inspiration from it, I am truly flabbergasted. If you don’t have anything nice to say, please don’t say anything at all. Saprena, Thank you! I'm so glad you find inspiration and new ideas here! That's always my hope as I share how I'm decorating my home and what I learn along the way. :) Hope you're enjoying your weekend! I really love your new pendants! They are beautiful and the trim on the rods are a great design. This is not a huge design thing, but I just think the overall look could be improved if you removed the white decorator rings on the top of the ceiling. I think it would look cleaner if you just had the small gold trim showing..it looks a bit busy to me with the 2 different size "rings"
Thanks Susan. I actually thought about removing the ceiling medallions when we switched the lights, but I like them for now and decided to leave them. Who knows? They might come down one of these days. You may not be a "professional decorator", but you inspire your readers to try new things and are brave enough to admit when things don't go as planned. 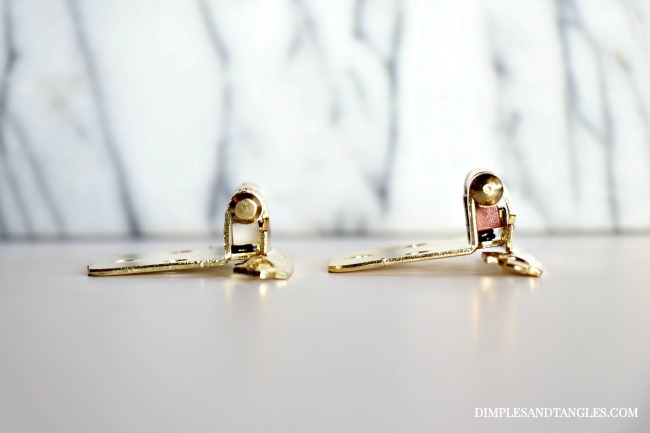 I love your blog and following your journey in your home. Thanks for sharing in such an honest and straightforward fashion! Thank you for those encouraging comments, Diane! I agree! Decorating is definitely an experiment, journey, and learning process for me. Thanks Kelly! Love the new lighting but I really want to know about your brick floors. I've never seen you talk much about them. I love the look of brick floors but don't know anyone who has them. Do you love.them or hate them? I really like them! After we moved in it took me a while to get used to walking on them with bare feet. These are not smooth and sometimes I would hit a bumpy corner on a tender part of my foot, but we got used to them and now have no issues. They don't really show anything, which is a good and bad thing! I should probably clean them more than I do but when you can't really see dirt and crumbs it is tricky. I guess that's the last "issue" I have with them, it's hard to know how to get them really clean. I sweep, vacuum, and mop them but sometimes the mop seems to just skim the surface, it's hard sometimes to get the crevices really clean. Some day I'd like to try a steam cleaner on them. But, even given all of that, I really like the character and warmth they give! I loved the old ones and I love the new ones! Beautiful.. no matter what you do, it always looks beautiful. love the new pendants! they are so beautiful and i always love brass!